Situated in Naples, Florida, Burn by Rocky Patel is a modern, 3,500-square-foot space that draws from a Byzantine color palate, marrying both vintage and contemporary designs influenced by Havana, the Near East and India. The last time you were at your local cigar lounge, you may have noticed that all the previously unmarked ashtrays now say Diamond Crown. Or that the Montecristo logo seems to appear on everything from matches to wall art. Bigger selection of Rocky Patel than you remember? It is very possible that your tobacconist has decided to brand his lounge. Branding can be as much a psychological approach to the market as it is an academic one, and applying it to the lounge dynamic is a recent trend in the industry that is giving cigar companies the chance to advertise and perpetuate their products by way of branded merchandise, promotional art, comprehensive cigar selections and, more abstractly, experience. Though some companies have had branded flagship smoking lounges and stores for years, an increasing number of branded lounges are opening in cigar shops and even on a stand-alone basis. The phenomenon has gained particular momentum with smoking bans, as these lounges and cigar bars have proven advantageous to cigar brands in smoking restrictive environments. Brand owner Rocky Patel has taken both routes. While he has put his name on nearly 30 cigar-shop lounges across the country, Patel's most ambitious investment came last November when he opened the luxuriously appointed Burn by Rocky Patel. Situated in Naples, Florida, the city where the company makes its headquarters, the modern, 3,500-square-foot space draws from a Byzantine color palate, marrying both vintage and contemporary designs influenced by Havana, the Near East and India. "When I observed cigar lounges all over the country, and the world, I noticed a common theme: everything looked like a library," says Patel. "I wanted to build something with 'wow' factor and something that transports and inspires you." Burn is an exercise in design fusion and this was accomplished by incorporating the dark, ambient lighting of a hookah bar with stained-glass embellishments, lit candles and well-researched furnishings. Intricate Moroccan-style lanterns hang from the ceiling throwing an almost ritualistic light on Burn's marble surfaces and inlaid tile floors. "The stone bar is underlit to look like flowing, volcanic lava," says Patel. "The effect is stunning. All these details combined with the cigar allow you to take a journey." Naturally, every Rocky Patel cigar is available here, but Patel enlisted such companies as Illusione, Fuente, La Flor Dominicana and My Father Cigars to create private labels just for Burn. There's a full bar and a list of fine wines. Fresh air filters in every few minutes and 1,300 square feet of outdoor patio space has been allotted for smokers who want to puff in the Florida sun. At sundown, Burn transforms into a more night-clubby environment. "It gets a bit louder after 11 p.m.," says Patel, "but there are many sections for quiet conversation." Patel plans on opening more Burn lounges in Washington, DC, and Las Vegas. signage, accoutrements and cigars. This face-lift method is far easier and faster than designing and building something from scratch, and many cigar stores across the country have been more than willing to participate. Back in 2005 Jeff Borysiewicz, founder and president of Corona Cigar Co., opened the first Avo lounge within his 3,500-square-foot retail shop in Lake Mary-Heathrow, Florida. "The question is 'What is the ultimate smoking experience the lounge will give the smoker?' " says Borysiewicz. "With the Avo lounge, we give the smoker an upscale experience to match the upscale image of the Avo brand, but it is not too high-end as to be out of reach." The lounge defines itself by its Avo-branded merchandise, a cigar exclusive to the lounge, and an alabaster bar top where smokers can sip beer, wine or port. A grand piano was also brought in for live performances by jazz pianist and brand ambassador Avo Uvezian himself. A few years later, J. C. Newman Cigar Co. put a well-funded lounge-branding campaign in motion. In September 2007, Davidus Cigars in Urbana, Maryland, hosted the first Diamond Crown smoking room. This got the attention of Borysiewicz and a few months later, another Corona Cigar shop, this one in Orlando, became the stage for an amenity-rich, 3,000-square-foot Diamond Crown lounge within its 6,500-square-foot store. "When we were presented with the lounge concept from Diamond Crown, I was impressed at just how well conceived the image and plan was," Borysiewicz says. Corona Cigar's Diamond Crown lounge is the largest, and most elaborate space in the Diamond Crown lounge program. Themed to be reminiscent of a Nicaraguan villa, the lounge offers full bar service, food, plasma televisions and the complete portfolio of J. C. Newman products. Diamond Crown lounges are popping up all over the United States, and today there are 54 in 22 states, plus an honorary Diamond Crown lounge in Afghanistan. "The designation of a Diamond Crown lounge is more of a philosophy than a look," says Eric Newman, president of J. C. Newman, which is based in Tampa, Florida. "All of our cigar lounges have a unique character but share the same commitment to excellence that is befitting the name Diamond Crown." Though not every shop needs so much space to participate, not every shop automatically qualifies. "They have to be nominated by their J. C. Newman regional sales manager and they have to meet a certain criteria within the home office," adds Shanda Lee, J. C. Newman's vice president of marketing. "Once that is established, we have a comprehensive program that allows us to partner with the retailer. Our main goal is to provide enough value-added support through product, advertising and other methods to help the retailer increase his business overall, not just with Diamond Crown." The trend is spreading. Altadis U.S.A. Inc. has aggressively implemented its own form of branding. In only two years it has converted almost 30 tobacconists into Montecristo or Romeo y Julieta branded lounges. "We look at every shop on a case-by-case basis," says Janelle Rosenfeld, vice president of premium cigar marketing and communications for the Fort Lauderdale, Florida, company. "We have to consider geography and demographics. The retailer has to already have a certain type of space and a distinct lounge area. This is very important. With smoking bans and anti-smoking legislation being so pervasive, retailers are becoming destinations for cigar smokers. We're adding more lounges on a monthly basis." One of Altadis's particularly impressive co-ops is the immense Casa de Montecristo in Countryside, Illinois. It's a meticulously designed, 8,000-square-foot cigar emporium where the Montecristo logo recurs throughout the store without garish overstatement. Anything from etched glass to ashtrays bear the mark, and the selection of Montecristo cigars is all-inclusive, spanning the entire regular-production portfolio as well as limited-edition releases. Casa de Montecristo's combination of amenities and distinct design elements just might make this haven a glimpse into the future of the high-end cigar retail landscape. The front area is furnished with a series of 40 solid-elder-wood cabinet display humidors filled with cigars, which supplement the shop's walk-in humidor, housing around 6,000 boxes. A limestone and walnut inner chamber deemed the Vintage & Rare Gallery is a veritable cigar cellar of aged smokes, and the Reserve Selection Room is a small glassed-in space built with 42 honeycombed cubicles crafted to resemble the shelving units of an aging room. They hold stacks of unbanded cigars, a combination of first releases, small batch or last-run brands. A V.I.P. program takes the experience to another level with a spacious bar area, conference room and even a theater. Not every setup for Altadis has to be so grand. The company has smaller lounges at Cuenca Cigar in Hollywood, Florida, The Porter House restaurant in Montvale, New Jersey, and in Washington, DC's, FedEx Field. Camacho Cigars took the initiative of branding a stadium in 2006 when it opened the Camacho Cigar Bar at Comerica Park in Detroit, home of the Tigers. Since then, it has opened other lounges. "I like supporting shops because I believe that the U.S. will eventually become a completely nonsmoking country," says Camacho president Christian Eiroa. "Stores will be the last place to smoke, so I'll do whatever I can to support them." Eiroa is in the midst of branding a Smoke Inn tobacconist in Port St. Lucie, Florida. "It really allows us to help the retailers," Eiroa adds. "Independent cigar store owners are getting clobbered right now. It's tough to be in business, but the lounge gives the retailer an edge over catalog or Internet vendors." Branded cigar lounges aren't only the domain of larger brands. In 2009, Toraño Cigars partnered with Fumée Cigars in Cedar Park, Texas, and brand owner Charlie Toraño is very pleased with the results. "The branded lounge is a win-win situation for the distributor and the tobacconist," Toraño says. "From our standpoint, it gives us more facings in the store, it gives us an opportunity to make a major branding impact, it brings us closer to the tobacconist and the staff becomes more educated about our product. This all translates to the store's customer base and takes the relationships to another level." In South Norwalk, Connecticut, the Cigar Factory Outlet is home to the largest Oliva Cigars branded lounge and club. An imposing awning emblazoned with the Oliva logo is telling of the store's focus. Although it carries myriad brands, Oliva's strong presence is obvious, despite the Cigar Factory Outlet's large warehouse setting. "Our clientele is very Oliva heavy," says Brian Shapiro, co-owner of the store, which charges a $350 annual fee for admission into the lounge. "Oliva rugs, ashtrays and cutters just reinforce the brand to my customers. Oliva is also the only brand we'll sell [to non-club members] by the stick." There are two more Oliva branded lounges in the United States—one in Tampa, Florida, (Tampa Humidor) and another in Baltimore (Cross Street Tobacco). Oliva also enjoys international exposure with lounges in the Netherlands, as well as Berlin and Düsseldorf, Germany. Outside the United States, one could argue that the 142-shop La Casa del Habano chain is a branded lounge for all Cuban cigars. In 2006, the first Cohiba Atmosphere cigar lounge opened in Tokyo, and now there are locations in Cancún, Buenos Aires, Hong Kong, Prague and Beijing. Casa Fuente, the only branded cigar lounge on the Las Vegas Strip, has become more than just a cigar lounge, but a destination spot for cigar lovers. A beacon for all things Fuente, Casa Fuente's colorfully tiled floor, lively bar and boldly baroque Fuente Fuente OpusX sign ushers you in to a humidor full of every brand and size made at Tabacalera A. Fuente y Cia., including complete portfolios of Ashton and Diamond Crown, a comprehensive selection of Arturo Fuentes, plus a vertical of the coveted OpusX brand, which extends to novelty sizes that are otherwise commercially unavailable, and a house brand called Casa Fuente. As a cigar oasis, Casa Fuente offers an ambience that is both distinctly Vegas and at the same time, evokes the comfortable and convivial atmosphere of a Havana café. As a business model, Casa Fuente exposes its entire repertoire to an international clientele interested in nothing more than spending money and stimulating their senses. It opened in 2005 and is to date the only Casa Fuente in existence. Cigar giant General Cigar Co. has invested in both the retrofit and flagship lounge models. 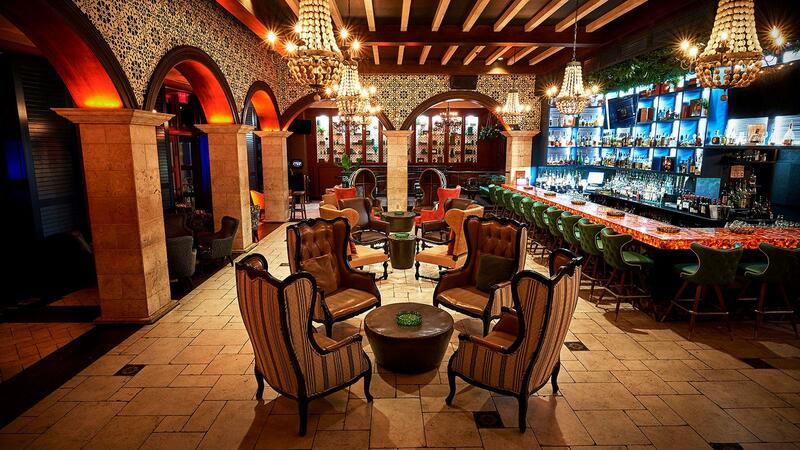 Club Macanudo, General's largest lounge, is the first branded cigar lounge in the United States. It opened in 1997 and has become a world-class destination for cigar smokers. The New York City club subtly intermingles stately décor and clubby ambience with Macanudo wall sconces, monikered ashtrays and branded bar napkins. The layout is zoned to welcome the cigar enthusiast of every social echelon. A marble lobby hall takes you to a reception room that leads you to the bar area and then gracefully transitions to a back parlor. You may consciously or subconsciously pick up on Punch or Macanudo logos on your way to a table at the full-service restaurant, or to a leather chair in one of the smoking salons. The club's cocktail program, table service and extensive cigar menu serve to enhance General's brand portfolio. Walls and walls of cigar lockers are occupied by celebrities and international clientele. Their engraved name plates are, in and of themselves, a form of endorsement, but General has also acknowledged the value of retrofitting and has branded a few small cigar shops as well. Nice Ash Cigars of Depew, New York, (a suburb of Buffalo) was the first "red dot" Cohiba branded lounge and Monte's Pueblo Pipe of Albuquerque, New Mexico, was christened the first Club La Gloria Cubana in 2009. Swiss company Davidoff of Geneva, with its branded flagship stores and lounges in New York City, has a different retail history and unique relationship with its patrons. New York's general store manager Michael Herklots explains: "The Davidoff store in its origin was the finest tobacco shop of its time that sold only the finest products available in the most professional and helpful way. But it didn't sell Davidoff brand products because there weren't any. Buying the product was the experience." Herklots calls such lounges a "win-win" for customers, but warns that a branded lounge can also create conflict with other brands. "Some companies might not want to host an event in another brand's lounge," he says. "It could get confusing, but that is up to the brand and the shop owner." Ultimately, Herklots maintains that a branded lounge, advertises the cigar "over and over," further driving home the impact, awareness and familiarity of the brand's name. Like all business models, branded cigar lounges don't always work. Club Macanudos have been shut down in Chicago, Miami and Washington, DC; smoking bans forced a Montecristo lounge out of PNC Park in Pittsburgh; Bethesda's La Flor Dominicana Lounge is no more; and both Camacho and Gurkha had to pull support from two separate shops in Long Island. Deloungings aside, the concept is thriving, especially as anti-smoking regulations leave cigar shops as one of few oases for cigar lovers. Retailers are benefiting from the relationship. "As far as I can see, there's no downside for a retailer to open up a branded lounge," says Borysiewicz. "It's just a question of the right cigar companies partnering with the right cigar shops." Florida tobacconist Abe Dababneh agrees. Half of his six Smoke Inn retail shops are branded Montecristo or Romeo y Julieta, including a 24-hour lounge. "It's been a very good relationship," he says. "There are certain obligations of our contract—we have to have certain facings and we can't have other branded paraphernalia—but they've been very good with their support. Having a branded lounge creates a clean, cohesive atmosphere and a nicer environment to smoke in." Dababneh has no restrictions on how many cigar brands he can carry, but says a branded cigar lounge can sometimes influence purchases. "In some of my shops, my customers are very savvy smokers and they know what they want," he says, "but in others, like our Montecristo lounge at the PGA National Resort, you get more transient smokers who aren't as sure, so naturally, they go right for Montecristo." Perhaps that is an example of what marketing analysts call "buying the brand over the product." Of course, many cigar smokers like to think that they are purely quality-based consumers and therefore more immune to marketing. So, at the same time, it is also the job of the cigar brand to reinforce the discriminating smoker's perception of himself. "A great brand raises the bar. It adds a greater sense of purpose to the experience, whether it's the challenge to do your best in sports and fitness, or the affirmation that the cup of coffee you're drinking really matters." Or the cigar you're smoking.